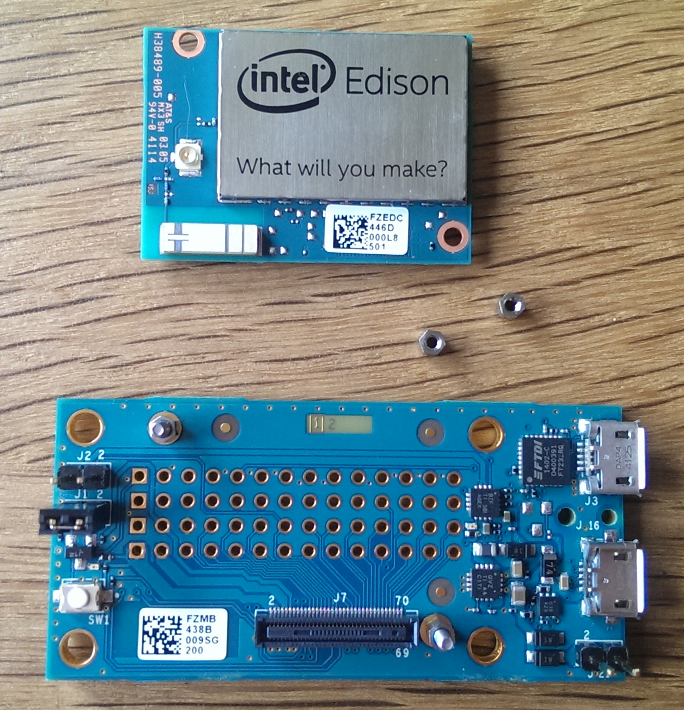 This is a guide howto setup the Intel® Edison. Intel has a lot of documentation but I want it to be in one place as a consistent story. Please leave a comment below when you have any questions. How did this all start? A while ago I received the Intel Edison as a sample from an Intel directly (Phil, many thanks for that). But I couldn´t do anything with it (yet). I needed a breakoutboard so I ordered it from Conrad. Since some months I use Ubuntu on my laptop exclusive for my hobby projects. This means that the instructions below will only cover the Ubuntu part. I will not share the Windows details with you, others will probably have done that for me. We will need to establish a hardware interface to the board, Program the latest firmware, have it connect with Wifi and then the magic will start to happen. All this can be found here below. Attach the Edison on the Breakout-board. Align the screws with the holes. Then press the two pieces together. Make sure not to press on the metal RF shielding (“What will you make?” printed on it). You will hear it click. Then screw on the hex nuts but not to tight. Connect one USB cable to the bottom USB connector (J16). Two green leds should light up. After some time you will see an extra device called Edison in your file manager. If it doesn’t, make sure the USB port can deliver enough power to the USB port. Connect the second USB cable to the top USB connector (J3). This connector exposes the serial console connection. On the Edison you will find a FTDI chip to make the physical connection to the RX and TX of the Edison’s board. Make sure the Edison’s USB drive is completely empty. This is the drive called “Edison”. Unzip the entire content of the Yocto image into that drive. Kernel command line: "root=PARTUUID=012b3303-34ac-284d-99b4-34e03a2335f4 rootfstype=ext4 console=ttyMFD2 earlyprintk=ttyMFD2,keep loglevel=4 systemd.unit=multi-user.target hardware_id=00 g_multi.iSerialNumber=1ce19aead23be74e83906cc17284e2ab"
[ OK ] Set up automount Arbitrary Executable File Formats F...utomount Point. [ OK ] Set up automount boot.automount. [ OK ] Set up automount home.automount. [ OK ] Created slice Root Slice. [ OK ] Listening on Delayed Shutdown Socket. [ OK ] Created slice system-serialx2dgetty.slice. [ OK ] Set up automount factory.automount. [ OK ] Mounted Temporary Directory. 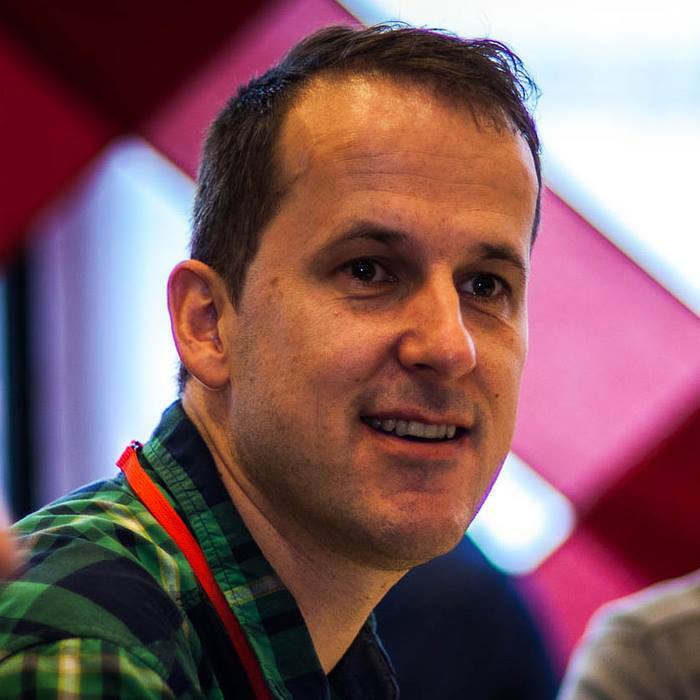 [ OK ] Started Create list of required static device nodes ...current kernel. [ OK ] Mounted /var/volatile. [ OK ] Started Trigger Flushing of Journal to Persistent Storage. [ OK ] Found device /dev/ttyMFD2. [ OK ] Created slice system-systemdx2drfkill.slice. [ OK ] Started Load/Save RF Kill Switch Status of rfkill2. [ OK ] Started Load/Save RF Kill Switch Status of rfkill0. [ OK ] Started Load/Save RF Kill Switch Status of rfkill1. [ OK ] Listening on sshd.socket. [ OK ] Started Watchdog sample daemon. [ OK ] Started Crashlog service. [ OK ] Started Edison RM button handler. [ OK ] Started Kernel Logging Service. [ OK ] Started Bluetooth rf kill event daemon. [ OK ] Started Daemon to handle arduino sketches. [ OK ] Started Daemon to reset sketches. [ OK ] Started USB Ethernet gadget. [ OK ] Started Network Service. [ OK ] Created slice system-systemdx2dfsck.slice. [ OK ] Started Mosquitto - lightweight server implementatio...T-SN protocols. [ OK ] Started Zero-configuration networking. [ OK ] Started Intel_XDK_Daemon. [ OK ] Started Serial Getty on ttyMFD2. [ OK ] Started Network Name Resolution. [ OK ] Started HSU runtime pm service. [ OK ] Started File System Check on /dev/disk/by-partlabel/factory. [ OK ] Mounted /factory. [ OK ] Started Load/Save RF Kill Switch Status of rfkill3. [ OK ] Started Bluetooth service. [ OK ] Reached target Bluetooth. This will show the connected IP Address. Remember this bcos you will need it later. On trick is to add the MAC address of the Edison to a fixed list of IP addresses on your WiFi router. This makes sure you will have the same IP Address every time you connect the Edison to WiFi. We want to get rid of the physical serial cable. This can be done by using an SSH link.